Free download Full Converter latest version. It is the amazing software that can convert almost all the common video and audio formats into other formats. In general video formats it can convert any video into ASF, AVI, DV, DVD, DivX, FLV, AVC, MKV, MOV, MP4, MPEG-1, MPEG-2, RM, SWF, VCD, WMV and Xvid. You can edit the format from edit button to change the format setting as you desire and require. It will show you the basic settings first but you can also edit the video and audio codec and other advanced setting listed at the upper right edge after going in the edit options. Full Converter also has the capability to convert the videos into animation and you may find the animation formats going in the Picture and Animation in the profile options. Moreover, if you want to convert some video for your cell phone, but you don’t know what video format or bit rate will be compatible to your device, you don’t need to worry about it if you have Full Converter or higher because it is the latest video converter that has categorized video formats for the famous mobile companies as Nokia, Samsung, HTC, Sony, LG, Motorola, Blackberry, iPhone, iPod, iPad, Apple, Android, Android Tablet and Windows Mobile. You can also select the cell phone model listed in the categories if you’ve any of them. Full Convert will convert the video exactly in the format that will be compatible to the selected device and will be in the best quality that the listed device can support. 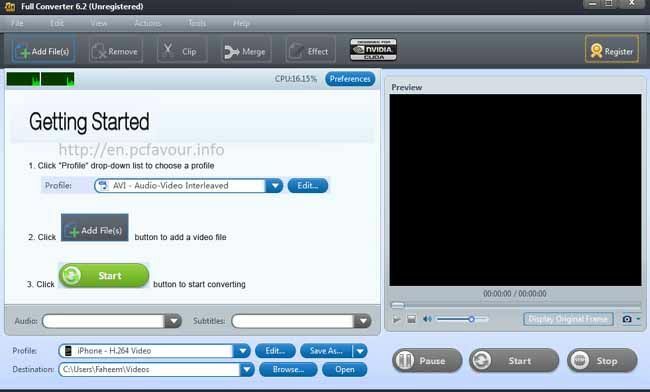 Full Converter is not just only a video converter; you can also edit a video using this amazing software. It allows you to add many effects to your video. You just need to go to the effects after adding your video in Full Converter. In the effects options you can crop the video, rotate in any direction, change brightness/contrast/saturation, add the water mark and many more effects that are listed in effects options. Full Converter can also crop the video according to your wish. Just add your video and click on the clip button at the upper area.